Adopted on May 6, 1997. The bullfrog is brilliant green and grows to a length of 20 cm. Its belly is typically white, but may be mottled with a silvery-grey flecking. The body is flat and broad, the head and eyes are large. The forelegs are short and the strong hind legs have webbed toes. A fold of skin extends around the eardrum, but there is no dorsolateral fold down the back, as in the green frog. Tadpoles are greenish-gold on the back with a light underside, sprinkled with fine yellow dots, and have flat tails, no limbs and gills. Males have a yellow throat, but the female's throat is plain. 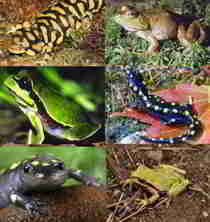 Large (9-15 cm SVL) olive, green, or brown frog sometimes with dots or obscure black blotches on back. Backs of juveniles and tadpoles covered with small, evenly scattered black dots. Belly ranges from white to yellow, in some individuals marked with black spots or networks. Tympanum distinctly larger than eye. Males with single vocal pouch under lower jaw, yellow throat, larger tympanum and, during the breeding season, swollen thumbs. Bullfrogs are predators. They usually feed on snakes, worms, insects, crustaceans, frogs, and tadpoles. They are cannabilistic and will not hesitate to eat their own kind. There have also been a few cases reported of bullfrogs eating bats. Males attract females for mating with their calls. Breeding takes place in May-July in the north, and from February to October in the south. Fertilization is external, with the females depositing as many as 20,000 eggs in a foamy film in quiet, protected waters. Fertilization is usually, but not always, by one male. About four days after fertilization spotted tadpoles emerge from the floating egg mass. The tadpoles have gills and a tail, which eventually disappears as the tadpole transforms into a full grown bullfrog. Tadpole development is quite slow; it may take as long as three years to begin transformation from the tadpole stage into the adult stage. Adults reach sexual maturity after an additional two years. North American Bullfrogs prefer warm weather and will hibernate during cold weather. A bullfrog may bury itself in mud and construct a small cave-like structure for the winter. 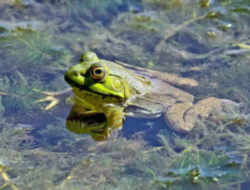 The call of a male bullfrog has a low frequency and can be heard over a distance of one kilometer. The sound is often described as a low rumbling "jug-o-rum". Adult males are very aggressive and defend their territories, which can range from 3 to 25 meters of shoreline, by physically wrestling with others. Their hunting style is 'sit and wait.' Bullfrogs wait for some type of prey to come by, then with a flash of the tongue, they grab it and bring it into the mouth. North American Bullfrogs must live in water and are therefore usually found near some source of water, such as a lake, pond, or river. Warm, still, shallow waters are preferred. Bullfrogs are becoming increasingly common in areas that have been modified by humans. Increased water temperatures and increased aquatic vegetation, which are common factors of lakes polluted by humans, favor bullfrogs by providing suitable habitats for growth, reproduction, and escape from predators. Bullfrogs have a much higher critical thermal maximum than most other frogs, meaning that they are able to thrive in higher water temperatures. Bullfrogs have a longer breeding season and a higher rate of pre-metamorphic survivorship, which also allows them to be more successful than other frogs. Colorado, among many other places, is experiencing problems due to introduced bullfrog populations. Bullfrogs may have been introduced accidentally to trout streams and lakes during the Colorado Divisions of Wildlife fish stocking operations. 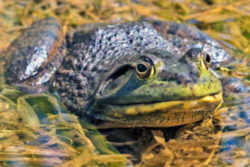 Bullfrogs occasionally invade fish hatchery ponds and their larvae are caught along with the fishes routinely stocked in ponds and reservoirs. 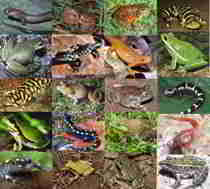 Most fish are averse to eating bullfrog tadpoles because of their undesirable taste. WHEREAS, the versatile and prolific bullfrog is an integral part of the ecology of Oklahoma and generally represents the importance of all species of amphibians to the environment and our state. THAT the bullfrog, "Rana catesbeiana", be recognized as the state amphibian of the State of Oklahoma. THAT copies of this resolution be distributed to the Director of the Department of Wildlife Conservation; Dr. John Turner, Superintendent of Brushy Dependent School District; Darlus Edwards, Assistant Principal of Brushy Dependent School District; Pat Grabe, Seventh Grade Teacher at Brushy Dependent School District; and to the students of the Seventh Grade Class of Brushy Dependent School District. Adopted by the House of Representatives the 5th day of May, 1997.Adopted by the Senate the 5th day of May, 1997.Filed with the Secretary of State May 6, 1997. 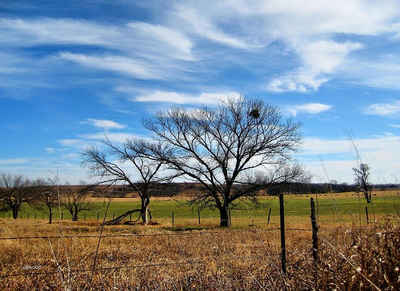 Because the Bullfrog was adopted by concurrent resolution, the signature of the governor was not required and the bullfrog is not listed in the Oklahoma Statutes.